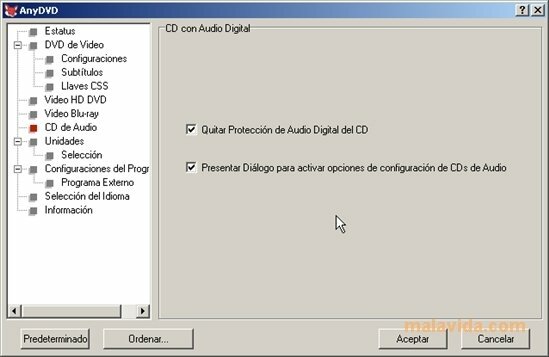 After some time, the optical discs that we buy, like CDs and DVDs, can break or get lost, so it's a good idea to save a backup of all of them, so that in the case that the worst happens we can recover an identical copy of the data. The main problem lies in the protection systems that prevent us from making the backups that we are legally entitled to (this is subject to the laws of different countries and may vary). Fortunately, there are tools like AnyDVD, that allow us to make backups that are completely identical to the original ones, regardless if we are dealing with CDs, DVDs or Blu-Ray discs. Developed by SlySoft, the same company in charge of CloneDVD and CloneCD, AnyDVD allows you to clone a DVD on another DVD, transferring all its contents without varying a single thing. And if we want it to, it can eliminate adverts, user prohibitions, parent restrictions and menus, as well as simulate a region code and make protection codes disappear. The ideal tool to make backups of our CDs, DVDs and Blu-rays. It includes a tool, Any DVD HD, that allows the user to copy from a DVD to the hard drive of the computer, so that we can decide if we want to burn it on another DVD or not. This application also offers support for high definition standards, like Blu-ray discs, that include a rather complex protection code called BD+ and that we'll be able to avoid without any problem with AnyDVD. The trial period lasts for 21 days.